Global warming is creating a devastating effect on some of the world’s finest coral reefs. 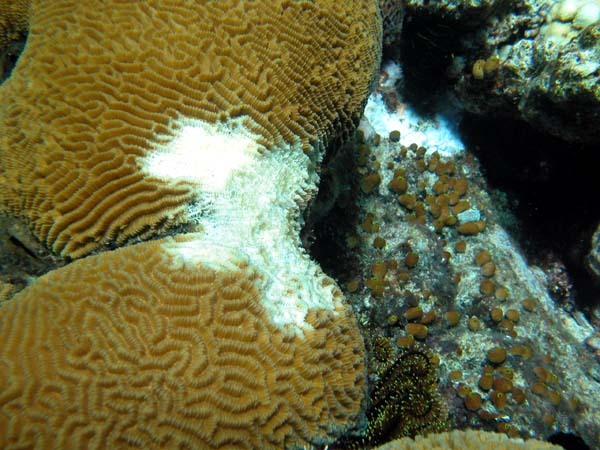 The Famous Caymans coral reefs are dying, Australia’s Great Barrier Reef is plagued with mysterious “White Syndrome”, here’s some info from Australian Institute of Marine Science Australia and their positions on the latest IPCC “Climate Change 2007” report. Scientists have been arguing “Is climate change likely to increase disease in corals?” Dr John Bruno from the University of North Carolina explaining the clear scientific links between the widespread disease and ocean temperatures in an radio interview. Meanwhile, Nature Conservancy is teaming up with Florida Keys National Marine Sanctuary and the NOAA to see if coral reef can be reborn?